At the risk of being repetitively boring I must remind you that I am unable to provide much detail about these two stamp issues, but that has not stopped others who are not bound by the same contractual obligations with Royal Mail as I am. My friend WhiteKnight's Commonwealth Stamps Opinion reports today on these two sets and shows all the designs. You can see them here. The World War I (issued on 31 July) set is in the usual format of 3 x 1st class and 3 x airmail (£1.57). 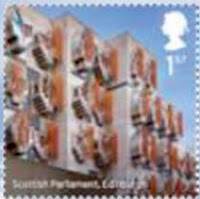 The Landmark Buildings set (issued on 13 July) is all 1st class and shows 10 very different modern buildings from around the United Kingdom, including two in Scotland, one each for Northern Ireland and Wales, with the rest from England. More detail on our website when Royal Mail have published details through their own media. Giant's Causeway yet again for Northern Ireland. This modern building lacks any architectural appeal whatsoever. It is just a box in the hillside. Many fine buildings in Belfast or elsewhere could have been chosen. I suspect that many people will have misgivings about the whole set, given the modern nature of the architecture. I believe I read footfall has something to do with the selection - though I may be imagining that! Just got my WWI issue and was surprised that the 4 Poppy stamps in the PSB are a different size to the issue stamps, being 35 x 37 instead of 35 x 35. 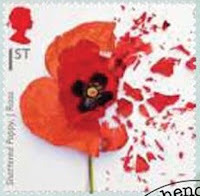 The poppy stamps in the 2006-8 Lest We Forget Miniature Sheets are also 35 x 37 mm, so they are the same - although there are shade differences.